Nannilam is located in the midst of Kumbakonam and Mayavaram in Tiruvarur district. Nannilam means prosperous land or the land which bestow goodness. 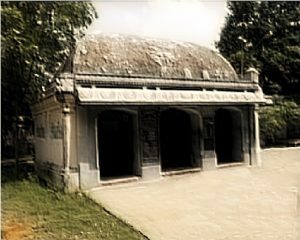 Nannilam has a two-thousand-year old temple in the name of Madhuvaneswarar. This temple has been constructed in two tiers in a small mount. While main part of this temple sanctums are on top of the mount to which you have to climb up the stairs and go, the rest of the sanctums are below the mount. Such two tier temples built during the periods of Chola Kings are known as the Mada Temple. This temple as established by the Chola King Kotchengat Cholan is located in the southern bank of the River Mudikontan in Nannilam. As soon as you enter the temple premises, you can see the sanctum of Lord Brahmapureeswarar which has been reportedly enshrined there by Lord Brahma. Lord Brahmapureeswarar, in the form of a Shiva Ling absolved the sins of Lord Brahma here and therefore derived the name Brahmapureeswarar. 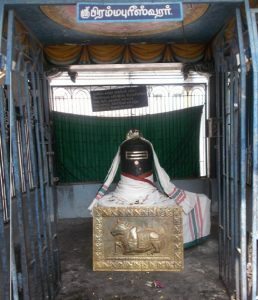 Adjacent sanctum is that of Lord Agastheeswarar as worshiped by Maharishi Agasthya. In the lower part of the mount, there are separate sanctums for Lord Siddhi Vinayaka, Lord Muruga, Devi Mahalakshmi, Lord Chandikeswara, Lord Saneeswara, Lord Bhairav, Solar Surya and nine planets called Navagrahas. There is a stair case that lead to the upper part of the mount adjacent to Brahmapureeswarar sanctum. On top of the mount one can see separate sanctums for Lord Madhuvaneswarar who is seated facing west and Devi Madhuvaneswari facing south.Lord Madhuvaneswarar reportedly self manifested there. Lord Somaskanda’s (Lord Muruga) shrine is also seen on top of the mount. It is believed that the devotees who visit this shrine if take dip in the water tank called Deva Theerththam during the month of February are relieved of their agonies and similarly when they visit the temple during the days of Pradosha, their financial position will turn to good. According to a folk lore, in the Kretha Yuga, pleased with the penance of a King called Brihuthraja, Lord Shiva manifested before him in the form of fire which in Sanskrit is called Jyoti swaroop. Not only Lord Shiva manifested before him, but he also threw his trident on the northern side of the temple site to create a water pond which was filled with the water released from Ganges on his head. 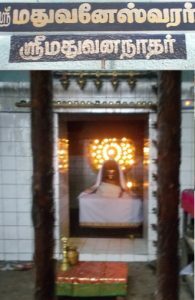 The legend of Madhuvaneswarar Temple in Nannilam has is partly linked to the legend of Thiruvanaikaval temple of Trichy. Once there were two Siva Ganas serving Lord Shiva in mount Kailas serving Lord Shiva alike and out of jealousy in serving him, they always quarreled with each other and fought for one thing or other. Once at heat of war of words, both of them cursed each other with the result both took birth as Elephant and Spider near Jambukeswaram, the present site of Jambukeswarar temple in Tiruvanaikkaval and continued to worship Lord Shiva. 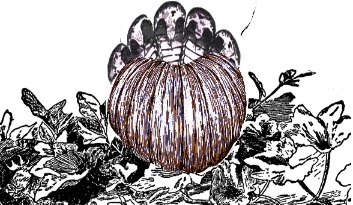 The elephant used to daily anoint the Shiva Ling which had earlier self manifested under a Jamun tree (Rose apple tree), with water collected from river Cauvery, while the spider constructed his web over the Shiva ling to prevent dry leaves from the tree dropping over the Shiva Ling and to prevent sunlight directly falling on Lord Shiva. 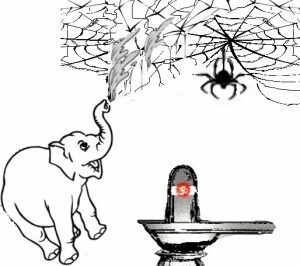 Unaware of the intention of the Spider which laid the web, viewing it as dirty material over the Lord, the elephant tore the web daily by spraying water from her trunk before cleaning the Shiva Linga with water and the practice continued daily. The spider became angry because of the action of the Elephant and one day crawled into the trunk of the elephant and bit the elephant to death by killing itself in the fight. Lord Siva pleased by the deep devotion of the two, absolved them of their curses. In the next birth, the spider was born as the King Kotchengat Chola of Chola dynasty and built over seventy-two tier temples for Lord Shiva, one amongst them being Nannilam Madhuvaneswarar temple. As enmity with Elephant in his past life still unknowingly continued in his spirit, he built the sanctum for Lord Shiva on top part of the two tier temple that he had constructed to ensure that not even a small elephant can enter the sanctum of Lord Shiva. 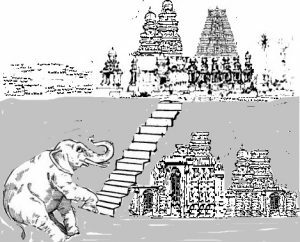 One has to climb the short and smaller width steps to reach the top, not possible for the elephants climb the stairs, to worship the prime deities enshrined there. 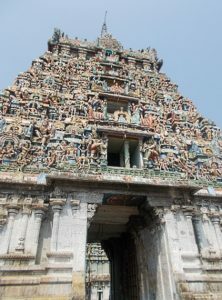 Such two tier temples were called Mada Kovil in tamil meaning temples on top floors. The Madhuvaneswarar temple in the village of Nannilam is one such Mada Kovil. There are two different lore connected to this temple. One of them says that in the Dwapara Yuga, one asura called Vishwaroopa continuously tortured the Celestial and angered by his act Lord Devendra fought with him and killed him. Vishwaroopa’s father sage Dwidsha performed a yagna and created another son called Vrudrasura from the fire to fight and destroy Devendra. 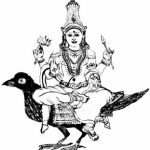 The asura Vruthrasura in his previous birth was a Celestial serving Lord Vishnu and on account of a curse given by Goddess Parvathi Devi he had to be born from fire as asura Vruthrasura in the next birth. Though Vruthrasura was born as asura with inherent feeling of hatred on Celestials, he was also spiritual minded partly on account of spirits of his previous birth. 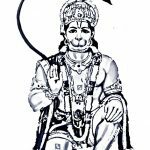 As Vruthrasura was born, on another other side, Lord Devendra in Deva log began to unknowingly practice unfair acts which angered the sages and saints and they began to depart from Indira Loga along with like minded Celestials. Their exit from Deva Loga weakened the position of Lord Devendra. Waiting for such an opportunity the asura Vruthrasura invaded Indra Loga and unable to match his might Lord Devendra faced defeat. Fearing for their life, the Celestials ran to Lord Shiva and pleaded for protection. Lord Shiva told them: ‘Vrudrasura’s end is not destined now and it may take some more time. However, at the appropriate time he will be killed by Lord Vishnu and till then to save yourself, all you you have to turn into honeybees and take shelter in the nearby forest where I will also to manifest to protect you. All of you stay there worshiping me by anointing honey and at appropriate time Vrudrasura will meet his death’. Taking the advice of Lord Shiva, the Celestials converted them into honey bees and stayed in the present temple site which was forest then where Lord Shiva had already manifested in the form of a Shiva Ling. The Celestials in the form of bees constructed a big honeycomb over the head of Shiva Linga from which honey dripped on the Shiva Ling as though they were anointing it with honey. Much before it happened, Lord Devendra began to prepare to wage a war with Vrudrasura. At the same time due to the virtues of the past life, Vrudrasura was unknowingly turning spiritual which actually shielded him from getting imminent death. Lord Shiva was well aware of such a situation to arise and hence he had advised the Celestials to turn into honey bees and live in the forest. Finally Lord Devendra waged the war against Vrudrasura. 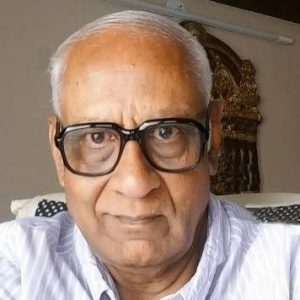 Even after several years passed, the war between Lord Devendra and Vrudrasura did not reach an end –neither victory nor defeat to either- and Lord Devendra was struggling to annihilate Vruthrasura. 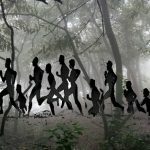 Over period of time, as depressed asura Vrudrasura too became tired of fighting and mentally leaning towards spirituality, Lord Vishnu realized that it was apt time to kill Vrudrasura and signaled Lord Devendra to get bones of Maharishi Dadisee to convert it into a weapon and kill Vrudrasura. Lord Devendra quickly acted to the advice of Lord Vishnu and killed Vrudrasura with the weapon made out of the bone of Maharishi Dadisee. Elated Celestials celebrated the victory in the jungle and prayed to Lord Shiva requesting him to manifest before them and to bless them. Lord Shiva manifested before them in the form of a Shiva Linga named Madhuvaneswarar along with his consort Goddess Parvathi as Madhuvaneswari in the same jungle where the Celestials remained in the form of bees and blessed them. The Celestials regained their own form and returned to their abodes. 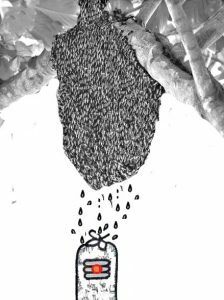 It is therefore believed that huge swarming bees in the temple area continue to worship Lord Shiva and Goddess Parvathi by anointing them with honey in invisible form. Since the Honey bees do not sting anyone even once, nobody disturb their comb or drive away the bees for collecting honey from the honey combs. The swarming bees there is considered to be Celestials. Another folk story tells that to get rid of Brahmahathi Dosha which he had attained because of killing Vrudrasura, Lord Devendra visited several temple sites where Lord Shiva had self manifested to offer prayer to him seeking absolving of the sin. On way he visited this shrine too worshiped Lord Shiva for a long time and finally got rid of the Dosha while praying in the nearby Aranyeswarar temple. Because the Celestial took the form of honey bees and worshiped the Lord by anointing him with honey, Lord Shiva seated in this temple attained the name Madhuvaneswarar. His consort was accordingly called Madhuvaneswari. Another idiom is that the buzzing sound of bees which were that of the Celestials are actually the chanting of mantras of the four Vedas by the Celestials in bee form and not that of the sound of mere buzzing. It is therefore believed that while one worship in the shrine, the power of the mantras intrude into one’s body destroying their past sins. There is another story told on this temple. Long before Lord Devendra eliminated Vrudrasura here, in Thretha Yuga once a war of word erupted between Divine serpent Athishesha and Lord Vayu. Each one of them claimed themselves to be greatest than the other, and to test their strength they decided to lift the mount Meru. 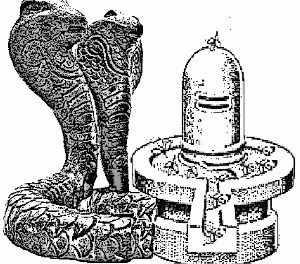 Divine serpent Adi shesha embarrassed the mount not leaving even a small gap to allow Lord Vayu to lift it. 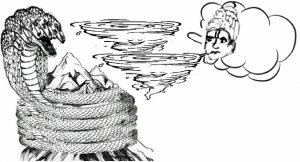 When Lord Vayu unleashed fury of cyclonic effect shaking the mountain scared Celestials requested them to abandon their fight when the divine serpent Adi shesha made out a small gap to enable Lord Vayu lift the mount to test his strength. 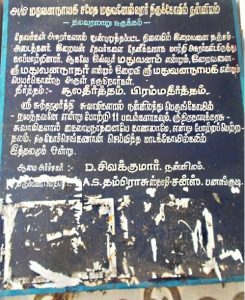 When Lord Vayu flew with the mountain, a small part of it fell in the present temple site at Nannilam which created a small mount on which the present temple Madhuvaneswarar came up. It is believed by learned Pundits that Lord Shiva himself desired such a mount to be created from mount Meru to enable the Madhuvaneswarar temple be established, and therefore ensured that such a drama occurred.